By looking pale, the wearer is not well. 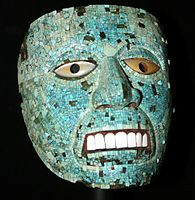 Turquoise lore revolves around its startling tendency to change color. For many centuries, people observed this phenomenon and believed it augured danger, sickness, or death. In the 12th century, Muhammed Ibn Mansur (King, 1867) observed that turquoise “grows clear or dull according to the state of the weather.” But the fact of the matter is, most turquoise is inherently unstable. For a gemstone, it is relatively soft and porous. It is sensitive to light, cosmetics, oils, detergents, even the acidity of one’s skin—all of which can alter its color and luster. Washing with hot water affects its brilliance rather adversely, while oil would take away its lustre…If it loses its lustre on being rubbed with oil, the lost lustre is revived by fat of sheep’s tail. It is, therefore, better kept by butchers, especially by those who do the skinning with their own hands. Very little of the turquoise sold in today’s marketplace is completely natural. Only 1 to 3 percent of the turquoise mined today is hard enough to cut and polish without some kind of treatment. 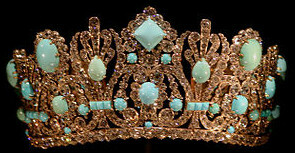 Fine-quality natural turquoise is usually medium robin’s egg or sky blue. Mother Nature has fashioned these gemstones so that their surface texture is less coarse and porous than the vast majority of turquoise specimens. 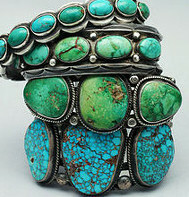 Natural turquoise is able to retain its color and luster as long as it is handled properly. Not surprisingly, these gemstones are rare and costly. Some of the Orientall ones are said to keep their colour perpetually, and those are called Turkies of the old rock, and some of these gemms are said by degrees to lose their colour and grow greenish, and these are called Turkies of the new rock. Although there is general agreement that gemstone enhancements should be permanent and stable, oil and wax treatments have been more or less accepted by tradition in the turquoise trade, especially with regard to better-quality stones. That said, many consider it bad practice to use these temporary treatments on inferior goods—unless the treatment is disclosed. Consumers should be made aware that waxed or oiled turquoise may “sweat” when it is heated or exposed to strong sunlight, and it may also develop a surface bloom over time. If at any time there do appear any kind of vanishing of colour in the Turky stone, it may be recovered by rubbing it with oyl of Vitrioll. Turquoise that is impregnated with clear plastic polymers is called stabilized turquoise. This treatment chemically alters the turquoise, which is considered unfavorable, but it also utilizes material that would ordinarily be unsuitable for gemstones. Stabilization transforms pale, chalky turquoise into less porous gemstones with improved color. Although stabilized turquoise created scandal in the marketplace at one time—because its true nature was not disclosed—it is now so ubiquitous that it is more or less accepted. There are exceptions, however. If dyes are introduced in the stabilization process, the treatment is generally frowned upon and the gemstones often look artificial. Stabilized turquoise should not be confused with what is known as Zachery turquoise. In some cases, the term enhanced turquoise is used to refer to stones that have undergone a proprietary treatment known as the Zachery process. Zachery-treated turquoise has been around since the 1980s, and since that time millions of carats have been treated. According to Fritsch, et al. (1999), “tests show that this process effectively improves a stone’s ability to take a good polish and may or may not improve a stone’s color. It also decreases the material’s porosity, limiting its tendency to absorb discoloring agents such as skin oils. 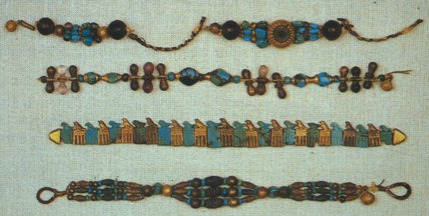 Examination of numerous samples known to be treated by this process revealed that Zachery-treated turquoise has gemological properties that are similar to those of untreated natural turquoise, and that the treatment does not involve impregnation with a polymer.” Although some Zachery-treated turquoise can occasionally exhibit a slightly unnatural color, it can also be difficult to distinguish from high-grade natural turquoise without advanced gemological testing. Reconstituted turquoise is a form of extreme treatment in which pulverized chips of turquoise are mixed with epoxy resins and pressed into blocks, which are then cut into gemstones. 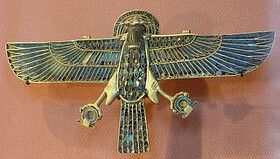 Because reconstituted turquoise is largely artificial, it is ranked below stabilized turquoise in terms of desirability. The Gemological Institute of America (GIA) classifies reconstituted or reconstructed turquoise as an imitation gemstone because it typically contains little or no natural turquoise.